It took Max a few moments to realise the implications of what Greg was saying. Twenty years ago we went back to the Moon, this time for good – or that was the plan. The colony in the Mare Crisium lowlands was an outpost on the new frontier, a centre of research and development, where new technologies could be created and tested by any company willing to take on the challenge. Now the Moon belongs to the machines, and a once-thriving colony lies in ruins. The experiment into self-replicating systems was a disaster, and while those responsible try to shift the blame, the machines continue to spread. The infested region is now over two hundred miles wide and growing. Reclaiming the Moon is a priority, and one man, the man who was coerced into designing the machines in the first place, is going to be central to that effort. But the world blames him for the disaster, and the first job will be to find him. Yet even then the machine eradication mission won’t be the only challenge. The destructive power that was demonstrated on the Moon is something that some powers would rather have for themselves. As the battle to eliminate the machines becomes a battle for who controls them, what started as a clean-up operation risks turning into all-out war. I was going to wait and see how CREATIONS did before even considering a sequel, but I had so many ideas for it that I had to go ahead and just do it anyway. Plus I’d been itching to try writing military SF, and although other stories of mine (e.g. Mind Games) have a military cast and setting, none of them are the kind of all-out combat story that usually deserve the mil-SF tag. So I took the plunge with this one, and I hope fans of the mil-SF genre (plus others of course) will like it. 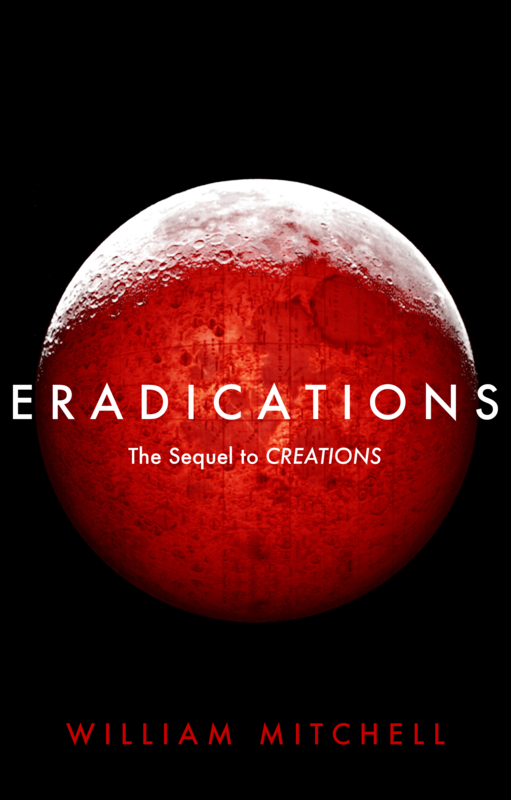 Eradications is available here, in paperback and Kindle formats. Well, the book has only been out a few weeks, but the first review is a good one!